Great time. Used RockMite 20 (.9562 lbs with 8 AA batts, key and earbuds). It is rockbound on 20 m but Steve WGØAT heard me – thanks for picking me up. Great fun. 400 mW. FT1000MP, 5W, TH6DXX, dipole, zepp, inverted vee. 20M was open at the start, but only made 3 QSOs there, NH, CA, WA. Heard, but could not work, NQ2W, K7TQ, and NK6A. Heard AB9CA in nearby AL, but didn't try to call him. 40M seemed quite good, but not too many stations QRV. Skip was long, but not too long as K3RLL in FL was strong. N5GW in MS started out strong, but skip soon dropped his signals down (after our QSO). 13 QSOs on 40M. 80M had some static crashes from the storms to our west, but QSOs were possible as far as K1QO in NH, NØAR in MN, and wGØAT in CO. Again, we could use some more activity and it would be more fun for everyone. 12 QSOs on 80. Thanks for all QSOs. 73/72, John, K4BAI. I fired up the KX3 with internal bats to 2 watts. The internal ATU was used to load up the CFZ at 50'. I was hoping 20M would open up this time of year, but I only heard/worked K7TQ and NK6A. 40M was a bit noisy from approaching storms, but fairly good. 80M was much noisier but yielded eight Q's including K1QO up in NH. Two banders with K7TQ, NK6A, K4BAI, K1QO, KS4L, NØAR, NQ2W, and WB5BKL. First SP in a long time. Worked some old friends again and several new ones. 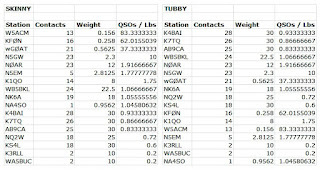 QSOs break down as: 20m - 2, 40m - 11, 80m - 5, Only worked the first hour. Thanks for all! K3/10 @ 5W to a 20 wire delta loop, a 40M dipole or a 40M extended double Zepp. One QRO contact omitted. 15 states this time. Best signals: 20M - K6EU, 40M - AD8Y, 80M - K4BAI. No triples this time but multiple 2-banders. One station on 80M was not readable here with my S7 noise level. My apologies... My thanks to all. Had fun. 7 contacts on 20 and the rest were on 40M. Nice to have the bands cooperating a bit more than the last two months and the Leap day event. Managed to get K1QO on 20 before the band closed down. My antennas were down quite low that night because of a bad storm in the mourning. I hadn't raised them up yet but decided to just have a go at it. 14 different states. Not bad. Conditions and participation much better than a week ago. Started out on 20 m with CQ answered by WG0AT. Great way to begin. 20 m was good for 10 more Qs until 20 minutes after when I switched to 40 m. Good turnout there too with another 15 Qs until I called it quits at 0320 Z with no more Qs for 15 minutes. 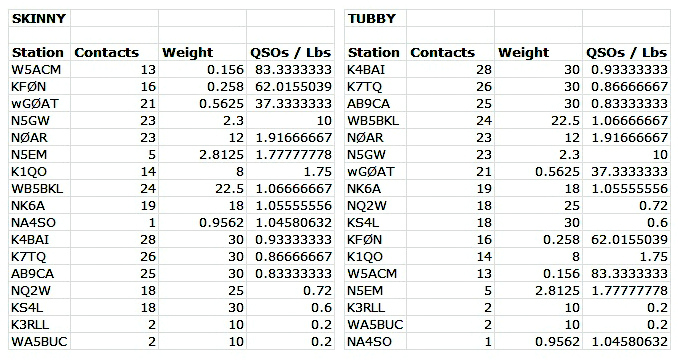 Two band folks were wG0AT, N5GW, NK6A, KF0N, KS4L, W5ACM, NØAR, and WB5BKL. Hopefully for April's SP I can get up into the mountains. All Q's were on 40 - AA5B Steve NM & AB9CA Dave AL. 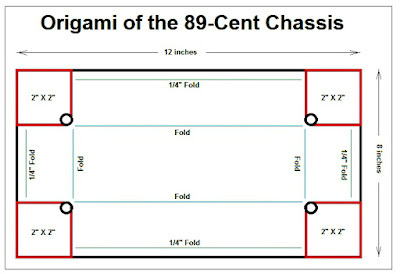 Here is what your finished 89-cent chassis will look like. It is quite possible to homebrew your own project boxes, starting with a flat piece of aluminum. 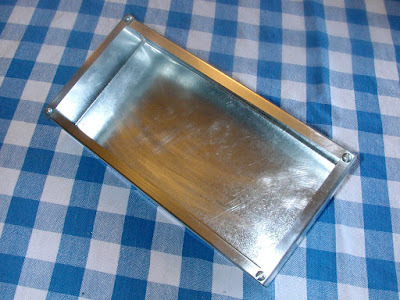 An 8x12-inch piece of aluminum at The Home Depot is less than a dollar and can be easily transformed into a project chassis 8-inches wide, 4-inches deep and 1 and 3/4-inches tall. Fancy metal-working tools needed? Absolutely not. This one was made in the 73 Radio Row workshop with a hand drill, awl, hacksaw, vise and a straight edge of metal or wood. It is really easy to do if you are willing to invest an hour-or-so. When was the last time you've said "Rig here is homebrew, including the chassis"? The photographs below tell the story of how it is done.Try it. You have less than a dollar and an hour-or-so to lose. 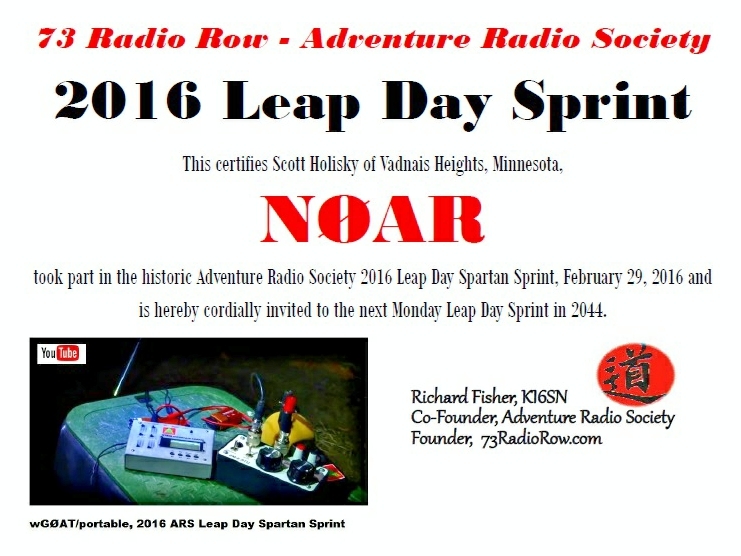 NOTE: http://www.73RadioRow.com is proud underwriter of the Adventure Radio Society. Please click on the images for a larger view. A 1/4-inch hole is drilled into the metal prior to making the cut-outs, shown in RED. 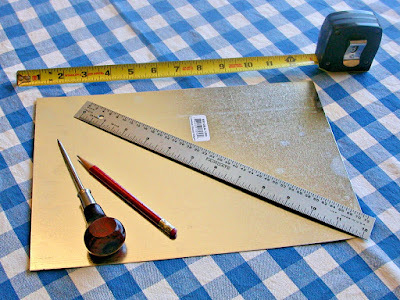 Simple tools are all that are needed to sketch out the pattern. 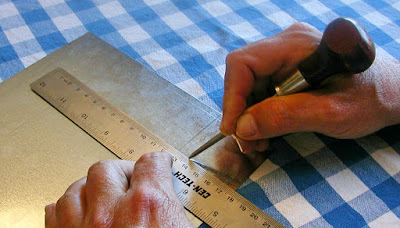 Etch the pencil pattern with an awl. Stress-reduction holes are drilled into the pattern before making the cut-outs with a hacksaw. 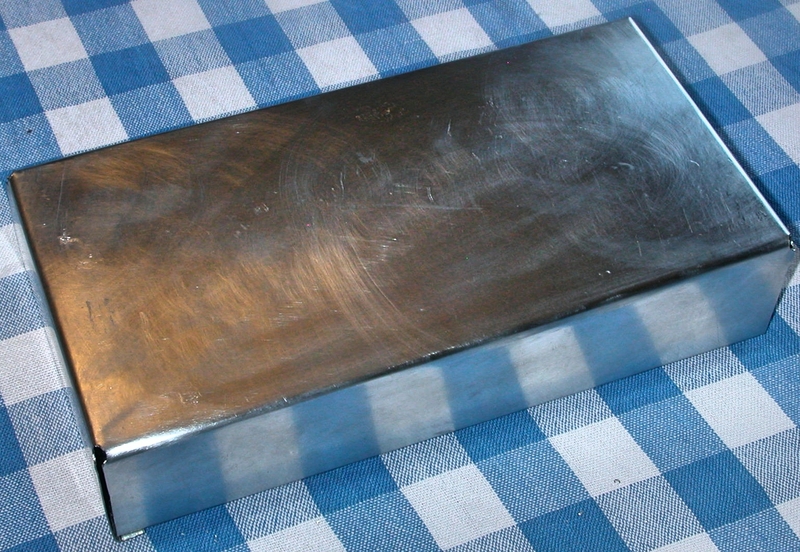 Prior to folding the metal, here is what the completed pattern looks like. 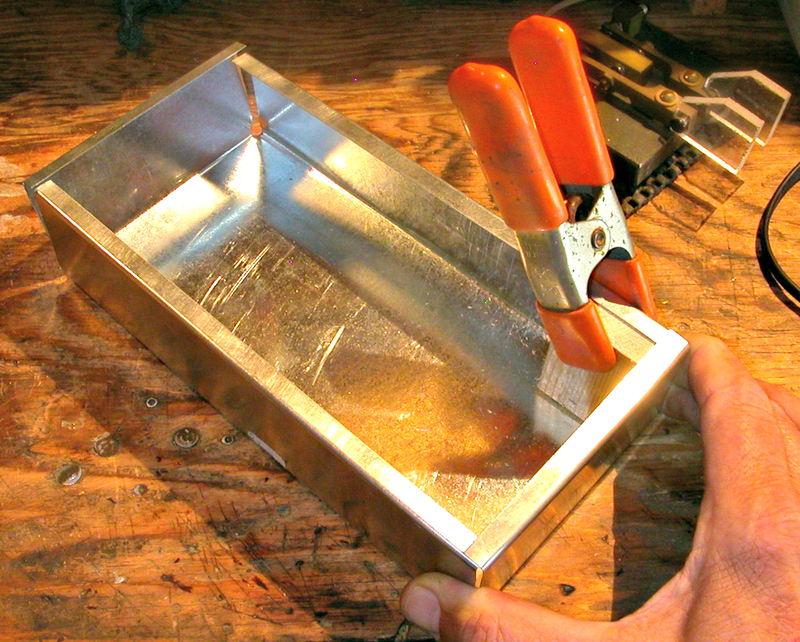 Held in a vise, the next step is to form the box following the lines you earlier sketched. 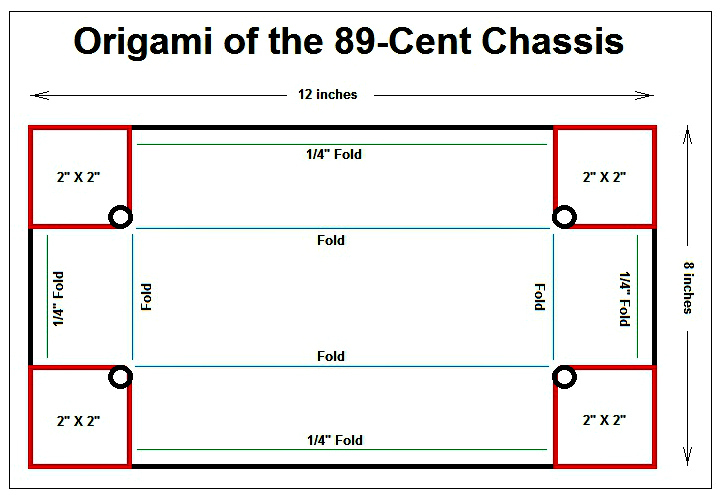 The 1/4-inch wide folds along the edge form the bottom of the box. A small piece of wood was slid under the edge for support in preparation for drilling. Small machine screws hold the box together. 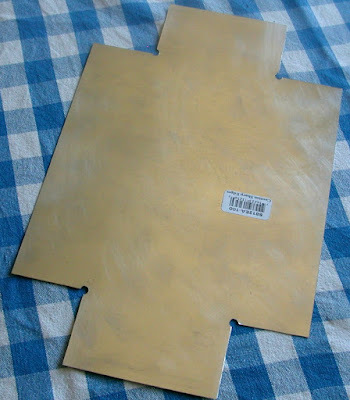 Once they are in place, flip over the box and admire the great work you have done. FOOTNOTE: In the vise, there are actually two bending edges. Again, they can be metal or wood. 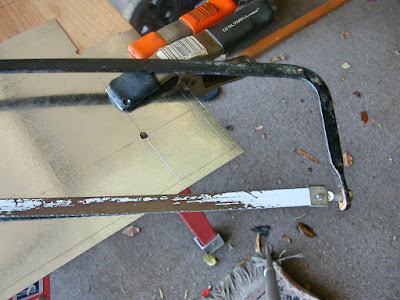 I used a piece of aluminum stock from the Home Depot that was cut in two with the hacksaw: http://thd.co/1QPxOYt They are much longer than the vise is wide. 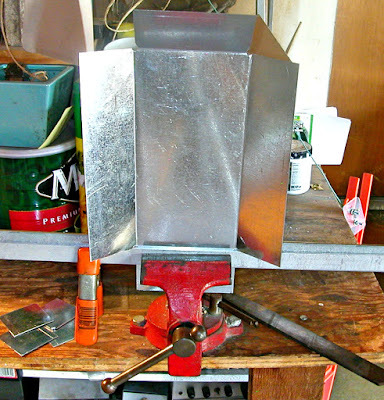 So for the smaller folds - indeed *all* of the folds if you'd like - the box is bent to the side of the vise. The metal "bend bars" are squeezed in the vise. 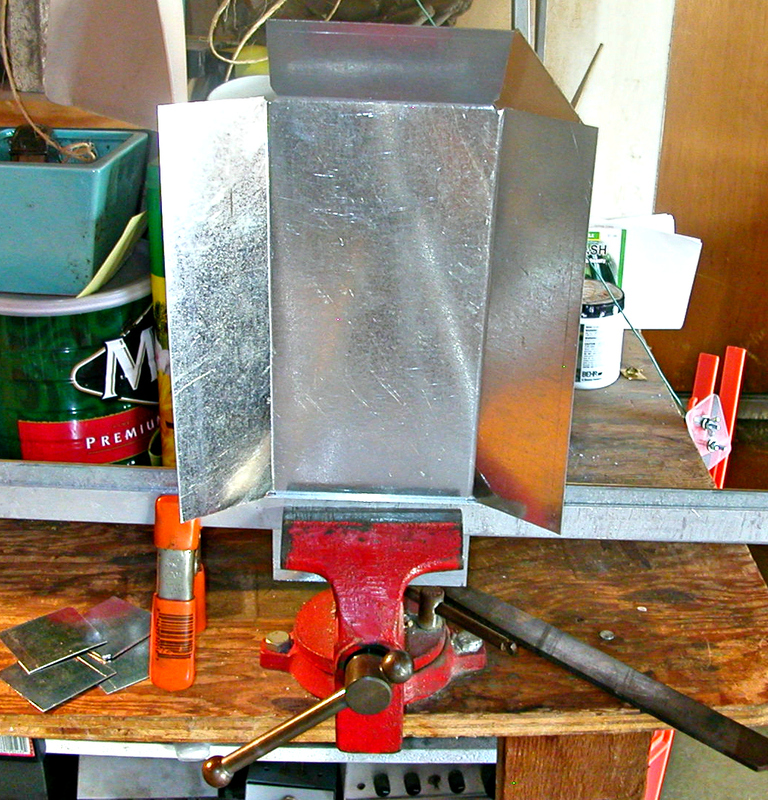 Then the aluminum box is squeezed between the two bend bars - to the left or right of the vise. So your bends are not necessarily *in* the vise, but beside it. I used a couple of clamps on the outer end of the bend bars to keep things as tight there as they would be in the vise itself. For an enlarged view please click on the image. 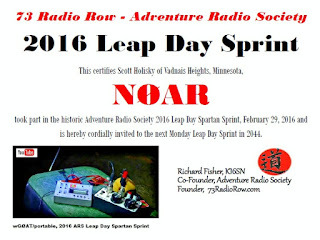 73 Radio Row, http://www.73RadioRow.com, in its partnership with the Adventure Radio Society, generously provided the certificates for the historic 2016 Leap Day Spartan Sprint. Every operator submitting SP data was awarded this commemorative document. 73 Radio Row is an underwriter of ARS activities. I only made 4-QSOs before the wind blew over the tipi! Click here to see a little video I made from Monday’s adventure! I only had half an hour to operate. 20 m was open for the first 20 minutes, at least, but I heard and worked only WB5BKL. Thanks to all who stopped by. Again, nothing on 20M, so concentrated on 40M. All Q’s with 40/30M Fan Dipole, tuned by the KX3. Hopefully, next month will get 20M going. or a 20M wire delta loop. 9 states on this Leap Year Monday Special. Best signals: 20M - NK6A, 40M - AB9CA, 80M - N5GW. Hope to hear all of you next week! ... My thanks to all. Had fun.